Rogue, Volume 1: Going Rogue, Robert Rodi (writer), Cliff Richards (penciler), Norm Rapmund (inker), Marvel Comics, 2005, ISBN 9780785113362, 144pp. Rogue is one of those X-Men characters that is well-loved by the fans, so it’s not surprising that Marvel finally did a Rogue mini-series. What is surprising is how lackluster that resulting story is. Rather than focus on what makes Rogue unique in the mutant pantheon–her ability to absorb memories but at a dangerous cost–writer Robert Rodi instead decides to investigate her background. This involves her going back to her southern home, lured there by a local emergency, then met by mysterious man who is unaffected by her powers. 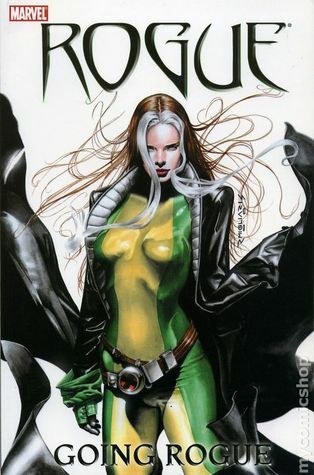 Unfortunately, the reason he is unaffected, and the background story itself, becomes increasingly divorced from reality which destroys the inherent pathos that is integral to Rogue’s character (i.e., her desire to be able to touch and be touched) and instead turns out to be a fairly generic family reunion story that adds one new element to her character, but otherwise leaves her untouched for the future. To its benefit, at least Going Rogue is not just another mighty Marvel mutant mash where the genetically gifted seem to pile up in panel after panel. Nor is it a super slugfest, and instead focuses on mystery and character. The addition of the blind mutant Gambit as Rogue’s longterm boyfriend with a problem helps complicate things, but not so much as to cause more than a page or two of suspense. It’s just that, given the possibilities, the resulting character study is mediocre and rather dull. Rodi is slightly better known as a novelist than a comics writer. His novel, Whatever Happened to Princess Paragon?, showed enough of a familiarity with comics fans and history that I wasn’t surprised to eventually find his name on a comic. He does well enough in this medium, although there’s nothing about the story in Going Rogue that would impel me to search out Rodi’s comic work in the future. Richards’ artwork is a bit on the cartoony side, as it doesn’t have much detail, but the lines are strong and clean. The best artwork here are the six individual covers, reproduced here in splash pages, by Rodolfo Migliari.